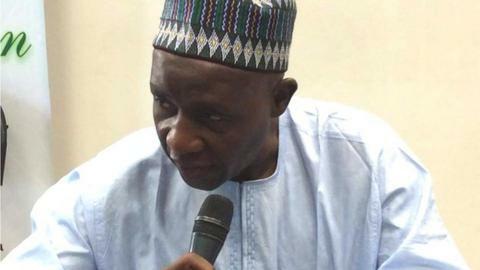 Former Nigeria Football Federation (NFF) boss Ibrahim Galadima has been appointed to be the head of a reconciliation committee to resolve issues within the organisation. The country's sports minister Solomon Dalung has tasked the committee with restoring peace to the troubled NFF. The move comes as Chris Giwa continues to challenge the legitimacy of Amaju Pinnick as NFF president. Galadima was chairman of the NFF between 2002 and 2006. A regional high court ruled recently that Giwa should be installed as federation president and that the Fifa-recognised head, Amaju Pinnick, be sacked. Ibrahim Galadima (chairman) Tijani Yusuf, Bolaji Ojo-Oba, Musa Amadu, Paul Bassey, Okey Obi, Carol Nkem Ojukwu. Football's world governing body Fifa issued a warning last week to ensure that Pinnick and his board continue in charge of the NFF or face a global suspension. The NFF swiftly appealed against the ruling from the Jos high court. The reconciliation committee has one week to submit its report. Dalung tasked the group to find a way forward in the present NFF crisis and to co-opt members, interface and reach out to anybody who can be of assistance to achieving their mandate. "Nigerians are gradually being factionalised into these two camps so you must put the country's interest above personal interest," the Minister said. "You must set aside your sentiments. If we continue like this, where will football be by next year? Can we even qualify for the World Cup?" Fifa ratified the election of Pinnick in September 2014 after refusing to recognise polls held that chose Giwa on 26 August 2014. As a result a defiant Giwa took his case to court and the election of Pinnick was voided, prompting Fifa to threaten a ban. Then Nigerian President Goodluck Jonathan held talks and ordered Giwa's associates to withdraw their case against Pinnick as a Fifa-ban was averted. However the problems resurfaced in January 2016 after a meeting called by Dalung aimed at reconciliation ended in more recriminations prompting Giwa to re-file his lawsuit. The ongoing power struggle means Nigeria's Olympic team is at risk of being banned from Rio this year, and the Super Eagles could be denied a chance to qualify for the 2018 World Cup in Russia. The 2018 qualifying draw takes place in June.